I grew up in Stoke-on-Trent, surrounded by pottery. My mum is a complete china addict; the kitchen cupboards hold more pottery than food and there are sets of crockery for every occasion. From a very early age I knew Pottery was always going to be an important part of my life. In 1996 I formally trained at Manchester Metropolitan University in Ceramics and Design achieving my BA Hons by specializing in reduction fire and oriental ceramics. Here I met the three loves of my life – my future wife Lucy (also studying ceramics), oriental pottery, and the potter’s wheel. My designs are developed on the North Wales coast where I spend a quarter of my working year recording in a variety of media the textures, shapes, colour and structure of the coastal landscape. This rich source of inspiration has a simple quiet affinity with the clay and processes that I use. My work varies between stoneware oxidation and reduction fire depending on the desired surface finish, colour of the clay body and glaze quality. 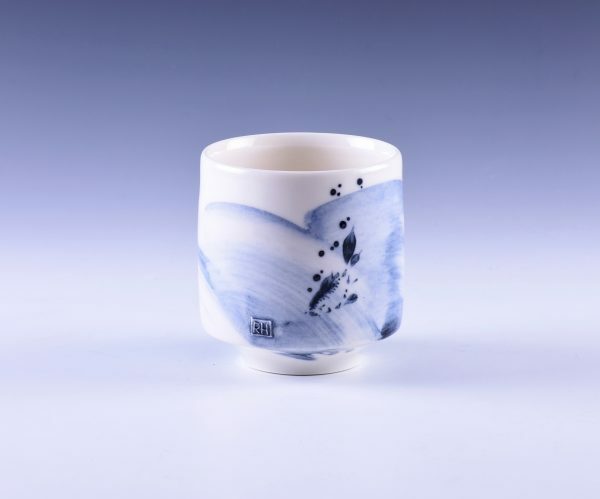 I draw on Eastern ceramic traditions to influence designs and techniques: stoneware glazes and forms from Song China, construction and firing techniques from Japan and Korean brushwork. I practice free flowing brushwork. I spend long hours repeating my designs to gain a fluid feel and simplicity that matches the thrown clay and fits as part of the pot, working in harmony with the form. My work is Influenced by a deep appreciation of Korean 16th century ware from the Chosôn dynasty. The brushed decoration is a combination of slips made from local clay, and found and hand-ground scrap flake iron, which produces a rich variation in colour and brush stroke quality and texture. The intimate contact with ceramics when eating and drinking is very important to my work as is the practical durability of porcelain for everyday use. Since Lucy retrained as a professional chef, we have fun designing dishes for dishes and using ceramics in the kitchen every day. The aim is to produce work with a quiet voice an eastern subtle palette with forms and compositions that create a narrative of landscape – hopefully a joy to use and live with.